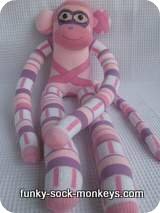 Here are some cute sock monkey pictures. 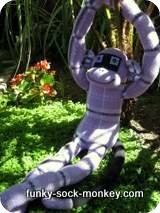 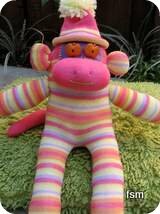 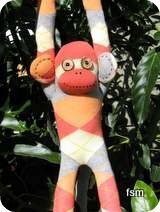 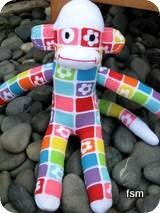 Fun images of different sock monkey doll toys that I have made from a variety of different socks. 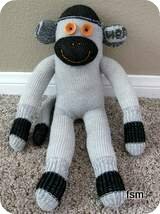 There is also photos of some other sock animals, a sock elephant that looks somewhat like an aardvark and a super cute sock cow. 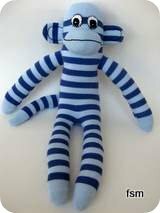 To find details on how a particular sock monkey doll was made just click on it's photo and you will shoot off to an individual "sock animal profile" with extra instructions and tips included. 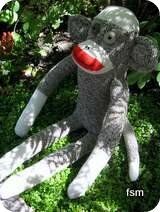 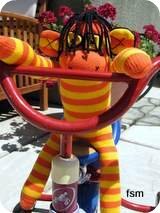 To see a close up images of funny sock monkeys faces, swing to the monkey face picture gallery. 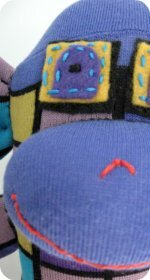 I made these little guys as a pair. 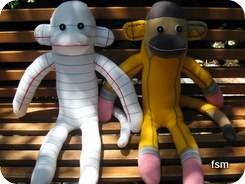 One monkey is made from a pair of notebook socks and his buddy is made from a pair of pencil socks. 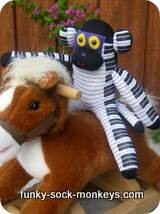 Thought they'd go hand in hand. 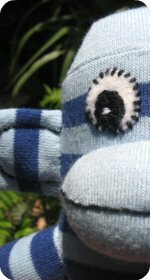 Have you made a sock elephant? 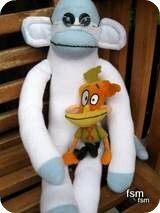 They are pretty cool to make actually. 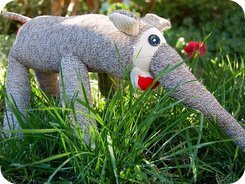 When I made my very first sock elephant (the guy to the left, that looks a little aardvark-ish) I just threw him together so I could get a feel for how it sat. 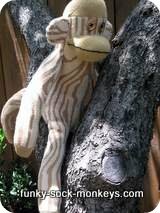 The result, hmmm... well, he's not the prettiest thing out there but I totally know how I will adjust everything when I make the next one. 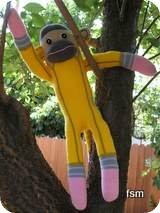 First off I'll take the time to line up his legs properly. 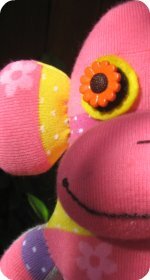 I don't even know how I messed up lining them up in the first place, it's not a hard step. 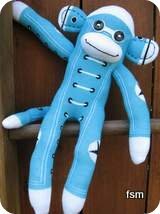 But.... somehow one front leg is sewn on way higher than the other, so he stands a little wonky. 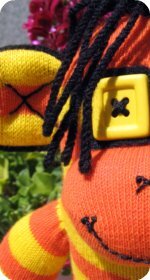 All adds to the character, right! 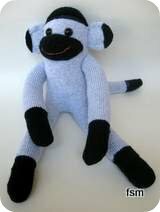 TIP: If you are new to making sock animals and your first sock toy doesn't work out so well, try again, you'll be surprised what you learn after making just one little fella. 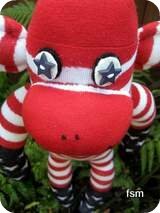 I say that from personal experience, my first sock monkey sucked big time, it was so ugly I never actually completely finished it. 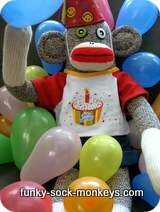 Yeah, it was that bad! 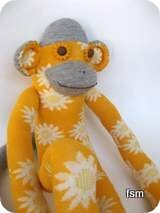 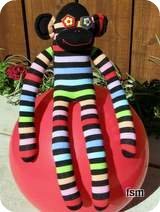 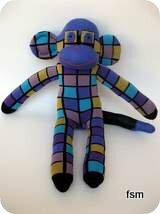 Making a sock monkey is pretty easy, just follow either the modern sock monkey pattern or the vintage sock monkey pattern if you are wanting a classic looking monkey. 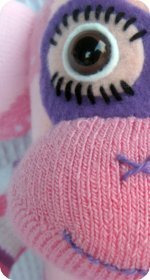 Sock elephants are fairly simple too. 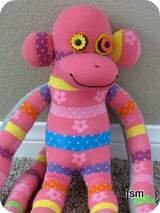 The sock elephant and sock monkey patterns are available on our pattern page. 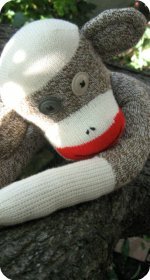 Thanks for checking out our monkey and elephant pictures.